This is located on the road to Cape Willoughby – follow the signs just as you leave Penneshaw. It is around 30 minutes on a sealed and unsealed road, and into Lashmar Conservation Park, where you will see the beautiful Antechamber Bay. 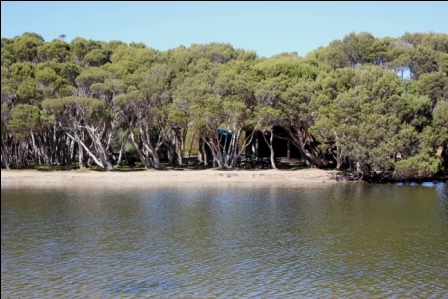 The campground is divided into 2 sites – East and West, and located on the pristine Chapman River. We visited the West campground. East campground seemed to favour more caravans and trailers, and was the busier of the 2 sites. Drive down a fairly steep hill, on unsealed roads to a large area which looks like a big parking lot and you are in the West Campground. But from that large drive in area, you can camp anywhere, as there are no truly designated sites. We saw some campsites that had views to the Bay, and were well screened. Another campsite here in West was by the River – access only for tent based campers as you cannot drive directly to your site but you could carry your gear past a small fence into a very well shaded and protected area directly on the River, and 5 minutes from the Beach. This area had 2 tables and benches, and we can only assume this area was designed for 2 sites. I think 2 tents would be enough as well – anymore would detract from its beauty. Access to the river was perfect – children could safely play in this tidal river – it was so clean and you could see all the fish in it clearly. The beach is close by and is stunning. On a warm day we were the only ones on this beach, which has lovely long stretch of sand and gentle waves. 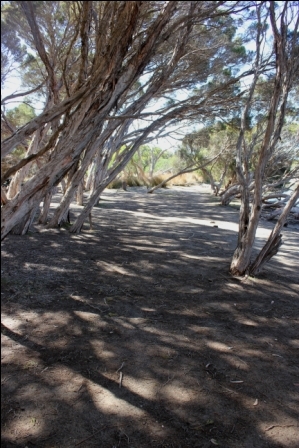 Later on we saw families from East campground walk along the shallow Chapman River, and cross the mouth of the river to access the beach. Bring your kayak or canoe, as this is lovely spot for a paddle and a great way to see more of the River and what lies on its banks. Lots of bushland surrounds all areas, so you do feel a long way from anywhere. There are flush toilets available, but no showers. They were clean but old, and if the area was busy, I think they would struggle to meet demand. Water is very limited, so bring your own. There are plenty of bins for your rubbish. You are some distance from any shops, so bring in everything you need. Heading back to Penneshaw for something you may have forgotten would be a pain. This is one area we would definitely return to. It is a beautiful location, and to sit on the river in the shade on a warm sunny day is delightful. The ability to have your campsite so close to the water is another attraction. Recommended campground for self sufficient campers. West campground – best suited for tent based campers. Antechamber Bay camp - tent campers only in this area.